I’d never poached pears before. Not on the stovetop or in a slow cooker. But I felt like it was time to try. 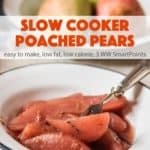 Before beginning, I read all about How to Poach Pears and then pulled out the my slow cooker. I opted to keep my first attempt at slow cooker poached pears super simple, using just water, sugar, cinnamon and cloves. Simple, easy, impressive and light, these gently spiced poached pears are the perfect do-ahead dessert. You can serve them plain or dress them up with a little vanilla ice cream or whipped cream. Or get even fancier with a drizzle of dark chocolate or caramel sauce. They would be a nice accompaniment to a sliver of gingerbread or spice cake too. According to my calculations, each serving has just 108 calories, *3 Weight Watchers PointsPlus, *3 WW Freestyle SmartPoints. Enjoy! After poaching the pears, while the liquid is still warm, add approximately 1/2 cup dried cranberries, raisins, or dried currants and let them plump. In place of the water, you can use 3/4 cup water and 3/4 cup white wine (sweet or dry) or sparkling cider. 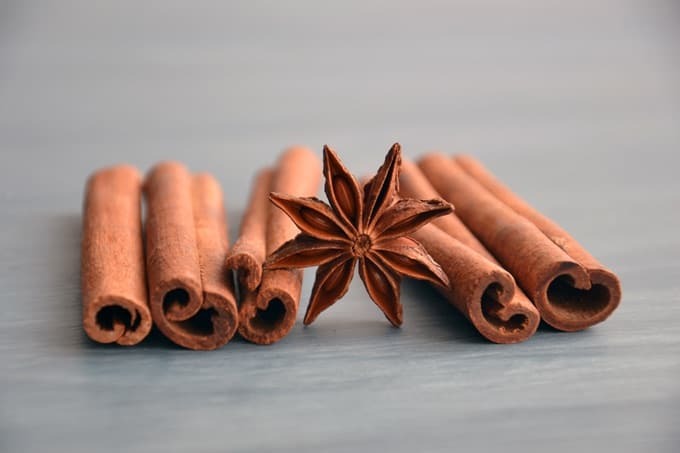 For Poached Pears with Asian Spices add 3 star anise, 5 slices fresh ginger, and 2 cloves to the poaching mix. To be extra fancy, drizzle with caramel sauce or chocolate raspberry sauce before serving. Also good alongside a sliver of gingerbread or spice cake. 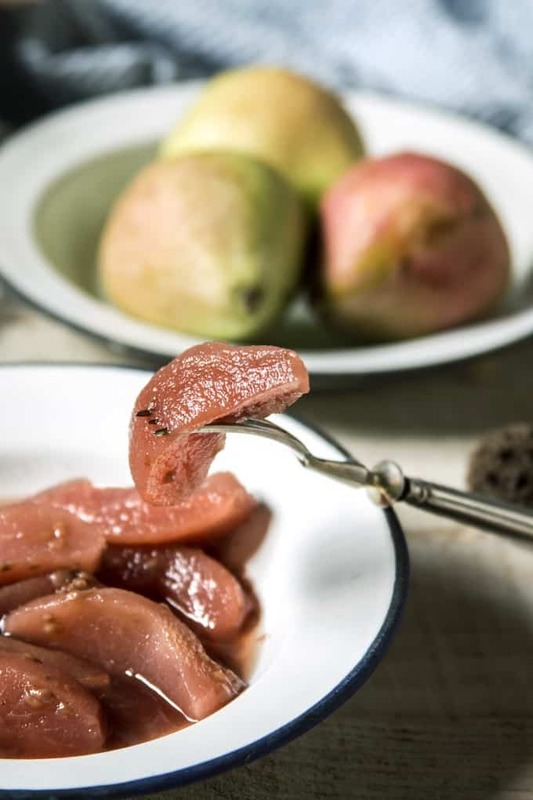 If you’ve made these crock pot poached pears, please give the recipe a star rating below and leave a comment letting me know how you liked them. Place the pears in the slow cooker. Stir together the water and sugar, add the cinnamon stick and cloves and then pour over the pears. Let cool and then fish out the cinnamon stick and cloves. Serve chilled or warm, plain, or with a dollop of vanilla yogurt or whipped cream. Transfer the pears and their liquid to an airtight container and refrigerate. Hi Martha – I’ve been making poached pears for years now and find them particularly tasty at this time of years. I use the same spices as you do with the addition of some fresh ginger slices. Instead of water and sugar, I use diet ginger ale. I usually have a fair bit of poaching liquid left over and have found that if the pears are soft enough and are cut in quarters or chunks, they marinate really well in the fridge without having been cooked. I’ve never tried it in a slow cooker but next time will do so. Love all your recipes and look forward to receiving and trying them. I’m now on a slow cooker kick and will be making your cabbage and white bean soup this weekend. I love cabbage but live on my own and the cabbages seem particularly large at the moment and a girl can only eat so much cole slaw! Thanks for your idea about marinating pears in the fridge as an alternative to poaching. I love my slow cooker, but also like to roast cabbage and sauté it sometimes too as an alternative to coleslaw!